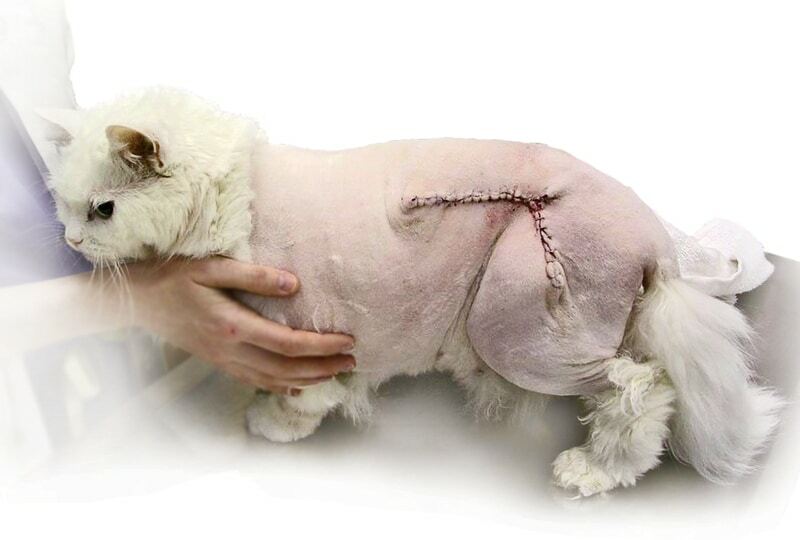 Feline injection-site sarcoma, or FISS, is a controversial topic; however, Dr. Richard Ford presents a comprehensive overview of the history, literature, and current issues associated with FISS. In addition, two very interesting questions are answered: What do we still need to learn about FISS and how do we lessen the risk for its development in cats? Today, among the spectrum of vaccine adverse events reported in dogs and cats, feline injection-site sarcoma (FISS) ranks as the most serious. Although it occurs infrequently, the consequences of a malignant tumor developing at a vaccination site are devastating to the patient and owner. Tumors linked to vaccine administration are high-grade sarcomas. Untreated, affected cats will die from complications associated with the tumor. Time from vaccination to tumor development is typically between 3 months and 4 years. A smaller number of tumors develop 5 or more years after vaccine administration. Radical excision (3- to 5-cm margins and 2 muscle planes deep), along with radiation therapy, is recommended for tumors arising in skin over the thorax or abdomen. Limb amputation is recommended for tumors at injection sites on a limb. At the time the study was conducted, all FeLV and rabies virus vaccines licensed for cats in the U.S. were inactivated, adjuvanted products. This fact raised concerns that chronic inflammation caused by adjuvant-containing vaccines, rather than one particular vaccine brand, played a role in the pathogenesis of these tumors. Since the early days of vaccine-associated sarcoma (now known as FISS) discovery, several studies have been published that characterize tumor pathology, offer diagnostic recommendations, outline treatment options for affected cats, and assess survival rates. A brief chronology of FISS is presented in Table 1. 1985 The first FeLV vaccine (inactivated, aluminum adjuvanted) is introduced (Leukocell, Norden Laboratories). 1985 Attenuated rabies virus vaccines sold in the U.S. are replaced with inactivated, adjuvanted rabies virus vaccines. 1987 Pennsylvania mandates administration of rabies virus vaccine to pet cats (at that time, all rabies vaccines sold in the U.S. were inactivated and adjuvanted). 1996 AVMA and AAHA jointly sponsor a meeting, leading to formation of the Vaccine-Associated Feline Sarcoma Task Force (VAFSTF) to fund and plan research and promote education and awareness. 1997 Vaccination-site guidelines recommend administration of rabies in distal portion of right hindlimb, FeLV in distal portion of left hindlimb, and all other vaccines in right shoulder region. 1999 VAFSTF, in conjunction with Veterinary Cancer Society, recommends “3-2-1 Rule” (see Table 2) regarding diagnosis of suspected sarcomas. Today, the profession still struggles with ambiguous recommendations and controversy over FISS risk management. These observations support the fact that chronic inflammation, due to a variety of causes, may lead to oncogenesis in some cats. Recommendations to avoid use of inactivated (adjuvanted) vaccines in cats have been met with resistance from the industry. This is not surprising considering the fact that the majority of rabies vaccines sold and administered in the U.S. are inactivated 1-year and 3-year vaccines. In addition, in the U.S., there is only 1 nonadjuvanted (recombinant) vaccine each for FeLV and rabies virus (only available as a 1-year vaccine). These vaccines are priced higher per dose than adjuvanted (killed) FeLV and rabies virus vaccines, a factor that influences purchasing decisions. Attenuated: Vaccine that contains the live virus or bacteria as the immunizing antigen. The virulence of the organism (antigen) is reduced, but is still capable of infecting cells and replicating following inoculation. Attenuated vaccines are not adjuvanted. Inactivated: Vaccine that contains the killed virus or bacteria as the immunizing antigen. Following inoculation, the antigen is incapable of infecting cells or replicating. All inactivated feline vaccines sold in the U.S. and Canada are adjuvanted. Recombinant: Vaccine manufactured through gene cloning (plasmid expressed) or by recombining selected DNA from a pathogenic organism with DNA from another virus (viral vectored), leading to the expression, following inoculation, of only essential antigens required to immunize. Recombinant feline vaccines sold in the U.S. and Canada do not contain adjuvant. Published estimates on the prevalence of FISS vary significantly, depending on the study design, numbers of cats in the study, geographic location of the cats, and the fact that injections other than vaccines are known to induce sarcomas. Reliably tracking and reporting prevalence, or the proportion of cats in the population that develop tumors subsequent to vaccination, are critical in learning whether recommendations to reduce or eliminate risk are effective over time. Tracking prevalence of FISS has proven challenging due to several reasons, including: low/inconsistent reporting of FISS, lack of a centralized database, and genetic influence. Mutations in TP53 (so-called “tumor suppressor gene”). Extrinsic factors, such as type of vaccine administered, frequency of administration, and number of vaccines administered at a site. What isn’t known is how these factors interact in the individual cat, leading to tumorigenesis. Predicting cancer is an important, emerging field in human and veterinary medicine. The ability to detect mutations in the BRCA1 and BRCA2 genes, for example, allows physicians to identify women at significant risk for developing hereditary breast and ovarian cancer. Mutations in the TP53 gene of some cats with FISS have been detected in studies conducted at the University of Minnesota. Although these studies suggested potential for assessing genetic predisposition for FISS, there is no commercially available test that will reliably predict which cats will develop tumors. If FISS is confirmed, current recommendations consistently cite the role of radical surgery with radiation therapy to prolong survival. It’s the degree of “radical” that obviously impacts the patient’s recovery, postsurgical quality of life, and cost (emotional and financial) to the owner. 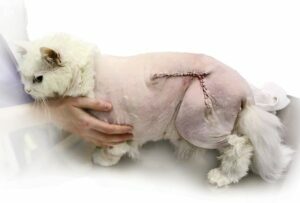 Due to the fact that injections other than vaccines can induce tumors in cats, it becomes reasonable to seek nonsurgical treatment and management options to limit the consequences of surgery. At this time, medical treatment of FISS offers limited value to the individual patient, even when combined with radiation therapy. After over 20 years of causing, diagnosing, and treating injection-site sarcomas in cats, the question that is reasonably asked is: What can a veterinarian do to mitigate the risk for, or limit the consequences of, FISS? Note that the following succinct review of recommendations has appeared in the literature and been presented at national conferences over the past several years; however, the recommendations have not consistently been subjected to scientific scrutiny and often represent expert opinion rather than results of published studies. Only administer vaccines when reasonable risk of pathogen exposure is apparent. Among adult household cats that have completed the initial vaccination series, core vaccines (feline parvovirus-herpesvirus 1-calicivirus) should be administered at 3-year intervals. Rabies vaccine should be administered according to state or local statutes and at an interval consistent with the product label. Only administer noncore vaccines to cats with realistic exposure risk. Only administer parenteral vaccines by subcutaneous route. Intramuscular administration of vaccines does not reduce the risk for FISS. Furthermore, a tumor that develops in skeletal muscle (deep) may be detected later than a tumor that develops in skin (superficial). Administer vaccines in accordance with current vaccination site recommendations. Current vaccination site recommendations need to be reassessed. Although most veterinarians seem to follow recommendations published by the VAFSTF in 1996 (rabies, right rear; FeLV, left rear), FISS continue to be diagnosed at the interscapular region.9 Furthermore, it appears that most veterinarians prefer to administer vaccines to cats at sites above the stifle, not below, and over the right shoulder, rather than below the right elbow, as recommended in current feline vaccination guidelines (Figure). Figure. Postoperative cat with FISS at FeLV vaccination site. The tumor developed in skin over the left side of the pelvis, indicating an injection site high on the left side. Tumors that develop at this level pose a serious risk for invasion of the ileum if not treated early. Obviously, the recommendation to inject vaccines at distal limb sites is intended to facilitate complete removal of the tumor and minimize the risk of local recurrence, following amputation of the affected limb. However, tumors can, and have, developed simultaneously in 2 limbs in the same patient. In addition, consistently administering vaccines into distal limb sites results in the administration of subsequent vaccine doses into the same site, which may increase risk for tumor development. Concern has also been expressed over the fact that efficacy of licensed rabies vaccines has never been validated in cats inoculated below the stifle. Educate clientele about reporting postvaccination lumps. Contact the practice if any lump increases in size or persists beyond 1 month postvaccination. Manage postvaccination lumps in accordance with the 3-2-1 Rule (Table 2). Simply excising a small lump (lumpectomy) may complicate efforts to define the original site in the event sarcoma is diagnosed and the owner delays definitive treatment as the incision heals and hair regrows. Most postvaccination lumps are benign. However, if the assumption is made that the lump is malignant and no biopsy is performed, the cat undergoes unnecessary surgery and excessive tissue removal for a lesion that would resolve spontaneously. If a mass meets 1 or more of the following criteria, an incisional (not excisional) biopsy of the mass lesion is recommended. 3: Mass is known to persist for 3 months or longer. 2: Mass is, or becomes, larger than 2 cm in diameter. 1: Mass continues to increase in size 1 month following an injection. Perform routine thoracic radiographs in cats confirmed to have FISS. High rates of pulmonary metastases in cats with FISS justify obtaining thoracic radiographs (including left and right lateral views) prior to committing the patient and owner to a definitive treatment protocol. Avoid the use of adjuvanted (inactivated) vaccines whenever feasible. Adjuvant is a chemical, microbial constituent, or mammalian protein commonly added to an inactivated (killed) viral or bacterial vaccine to enhance the immune response against a selected pathogen. Adjuvants are known to cause local reactions characterized by inflammation, granulomas and, occasionally, sterile abscess formation.18 Currently, all inactivated (killed) feline vaccines sold in the U.S. and Canada are adjuvanted. Modified-live and recombinant feline vaccines are not. The hypothesis linking adjuvant-induced chronic inflammation to sarcoma formation has been suggested by several authors beginning in the early 1990s.3-5 Controversy over the role of adjuvant in sarcoma pathogenesis intensified with the publication of a limited number of studies suggesting there was no significant difference in FISS risk posed by adjuvanted versus nonadjuvanted vaccines.10,11,19 No studies have been published that suggest an adjuvanted vaccine is safer than a nonadjuvanted vaccine, with respect to FISS risk. The controversy surrounding safety of administering nonadjuvanted vaccines over adjuvanted vaccines is likely to continue. The scientific evidence simply isn’t available currently to support unambiguous conclusions. The consequence is that cats will continue to be diagnosed with FISS attributed to routine vaccination. Despite continuing controversy, the fact—that sarcoma diagnoses in cats became more common as the use of adjuvanted vaccines became more prevalent—remains a critical and undeniable piece of information that highlights a potential role for adjuvant in the pathogenesis of FISS. The recommendation to avoid adjuvanted vaccine in cats whenever feasible is justified. Sequin B. Feline injection site sarcomas. Vet Clin North Am Small Anim Pract 2002; 17(4):168-173. Romanelli G, Marconato L, Olivero D, et al. Analysis of prognostic factors associated with injection-site sarcomas in cats: 57 cases (2001-2007). JAVMA 2008; 232(8):1193-1199. Hendrick MJ, Goldschmidt MH. Do injection site reactions induce fibrosarcomas in cats? JAVMA 1991; 199(8):968. Hendrick MJ, Goldschmidt MH, Shofer FS, et al. Postvaccinal sarcomas in the cat: Epidemiological and electron probe microanalytical identification of aluminum. Cancer Res 1992; 52(19):5391-5394. Hendrick MJ, Brooks JJ. Postvaccinal sarcomas in the cat: Histology and immunohistochemistry. Vet Pathol 1994; 31(1):126-129. Kass PH, Barnes WG Jr, Spangler WL, et al. Epidemiologic evidence for a causal relation between vaccination and fibrosarcoma tumorigenesis in cats. JAVMA 1993; 203(3):396-405. Gaskell R, Gettinby G, Graham, Skilton D. Veterinary Products Committee (VPC) Working Group on Feline and Canine Vaccination. Department for Environment, Food & Rural Affairs, London, May 2001. Vaccine-Associated Feline Sarcoma Task Force: Roundtable Discussion. The current understanding and management of vaccine-associated sarcomas in cats. JAVMA 2009; 234(3):376-378. Shaw SC, Kent MS, Gordon IK, et al. Temporal changes in characteristics of injection-site sarcomas in cats: 392 cases (1990-2006). JAVMA 2009; 234:376-380. Srivastav A, Kass PH, McGill LD, et al. Comparative vaccine-specific and other injectable-specific risks of injection-site sarcomas in cats. JAVMA 2012; 241(5):595-602. Kass PH, Spangler WL, Hendrick MJ, et al. Multicenter case-control study of risk factors associated with development of vaccine-associated sarcomas in cats. JAVMA 2003; 223:1283-1292. Kass PH, Barnes WG Jr, Spangler WL, et al. Epidemiologic evidence for a causal relation between vaccination and fibrosarcoma tumorigenesis in cats. JAVMA 1993; 203:396-405. Hendrick M. Historical review and current knowledge of risk factors involved in feline vaccine-associated sarcomas. JAVMA 1998; 213:1422-1423. Lester S, Clemett T, Burt A. Vaccine site-associated sarcomas in cats: Clinical experience and a laboratory review (1982-1993). JAAHA 1996; 32:91-95. Macy D, Hendrick M. The potential role of inflammation in the development of postvaccinal sarcomas in cats. Vet Clin North Am Small Anim Pract 1996; 26:103-109. Gobar G, Kass P. World Wide Web-based survey of vaccination practices, postvaccinal reactions, and vaccine site-associated sarcomas in cats. JAVMA 2002; 220:1477-1482. Richards JR, Elston TH, Ford RB, et al. The 2006 American Association of Feline Practitioners Feline Vaccine Advisory Panel report. JAVMA 2006; 229(9):1405-1441. Spickler AR, Roth JA. Adjuvants in veterinary vaccines: Modes of action and adverse effects. J Vet Intern Med 2003; 17(3):273-281. Wilcock B, Wilcock A, Bottoms K. Feline postvaccinal sarcoma: 20 years later. Can Vet J 2012; 53:430-434. Richard B. Ford, DVM, MS, Diplomate ACVIM & ACVPM (Hon), is Emeritus Professor of Medicine at North Carolina State University’s College of Veterinary Medicine. He is a retired Brigadier General from the USAF Reserve, where he was assigned to the Office of the Surgeon General at the Pentagon. Dr. Ford is also a past president of the NAVC Conference and continues his role as a member of the scientific program committee. His clinical interests are in the field of companion animal infectious disease; he is a prolific author and serves on both the AAHA Canine Vaccination Task Force and AAFP Feline Vaccination Advisory Panel. Dr. Ford received his DVM from Ohio State University and completed an internal medicine residency at Michigan State University. He held a previous faculty position at Purdue University.